After a week of light winds and the magic combination of small neap tides and bright sunshine on the planned day of diving, things were really looking up. 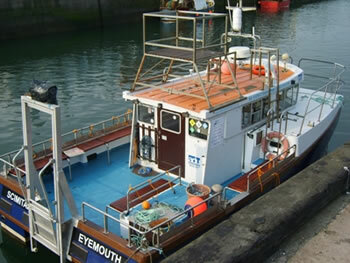 On arriving at the pontoon in Eyemouth harbour it soon became evident that Derek had taken heed of suggestions made from the previous dive trips aboard his vessel the M/V Scimitar earlier in the year. Gone were the rickety folding benches to be replaced by much more substantial seating complete with new stainless steel guards attached to the railings to prevent kit from sliding into the water. This time the revised layout of the Scimitar was going to be more tested with nine divers plus their kit including assorted twin sets. 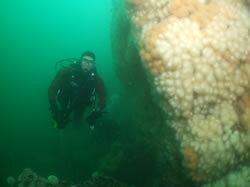 Dave Robson, still recovering from a recent knee operation, volunteered to be the dive manager for the day. Once all the kit was safely stowed the Scimitar headed out of Eyemouth harbour before turning north and motoring down the coast towards the distant fishing village of Burnmouth in search of the wreck of the East Neuk. This small cargo vessel originally started her working life as a steam fishing boat before eventually being converted to carry cargo between the small villages along the coastline. On the 30th August 1923 however, the East Neuk struck the South Carr’s rocks off Burnmouth village and was lost. Today, she is not a well-known wreck, not least because she is well broken up and quite difficult to locate as most of the wreckage lies in a series of steep gullies. Her wooden hull has long since disintegrated leaving only the corroding metal work behind. On this occasion the shot missed the wreck landing about 50 metres southeast of the main area of debris. Swimming into the gentle tide (normally this site is a slack water dive) we soon started to come across signs of wreckage in the form of corroding girders and pipes. Then we came across the upright propeller still attached to it shaft. Nearby were the remains of the steam engine and a large single boiler. 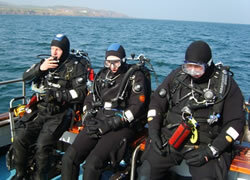 The exposed areas of the wreckage have a good covering of dead man’s fingers making for a nice scenic dive site enhanced on this occasion by good underwater visibility of several metres plus. 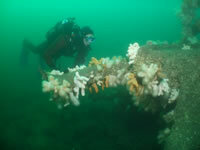 The wreck itself lies in just over 20m of water. Dive time on this occasion was limited to a maximum of 40 minutes. Once everyone was safely back on board the Scimitar headed north. 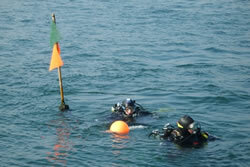 Gordon Lambert and Dave Taylor, in the interests of promoting better diver and fishermen relationships, volunteered to recover attract lobster pot. It’s not often that you get to see two Regional coaching instructors legitimately diving down a lobster creel line in a voluntary marine reserve! The pot was duly safely recovered, complete with all its attendant line and buoy and brought safely aboard, before the Scimitar headed away to the final dive site of the day, Leaguers Buss, near Coldingham Bay . This particular scenic site consists of a number of large rocky underwater pinnacles situated on a sandy seabed. Again, Leaguers Buss is not another particularly well known dive site but nevertheless is a very pretty scenic dive with the steep walls of the pinnacles being covered in a particularly rich and colourful carpet of marine life. Numerous small lobsters were also observed hiding amongst the nooks and crannies in the underwater cliff face. Back at the pontoon in Eyemouth harbour kit was swiftly unloaded and the day ended with a beer in the Contented Sole public house. 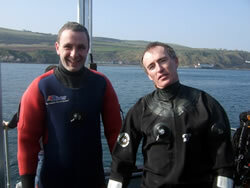 Many thanks to Gordon Lambert, Dave Robson and Derek Anderson (the skipper) for another great days diving. 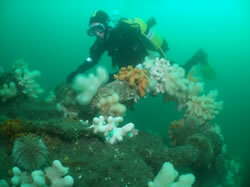 Shetland Islands Wrecks and Kelp!